Today's Draw: Ace of Wands from the Science Tarot—Nebula. Is there something you're doing right now based solely on gut instinct? When you look back on your life, do you see a lot of "clues" that haven't yet materialized into anything? What do you see in your trail of stardust? 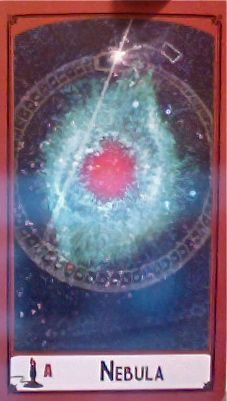 The book for this deck says, "apparently from nothing, the star stuff comes together and begins to take shape. But what will become of this gathering of dust, this mass of potential, this nebulous form just beginning to emerge?" The Ace of Wands signals a beginning of some creative effort...the first steps into a sea of possibilities. Maybe you're just now thinking of pursuing a new hobby. That thought is a speck of stardust. The class you're taking? That hunch your following? Another speck. And another speck. Sometimes we don't know what we're building until it's half built. After ten years of working in advertising agencies, I stunned myself by making a split-second decision to become a freelancer. In the very moment I made my decision, I realized it was the trajectory I'd been on my entire career. A minute before, I was clueless. A minute afterward, I had a calling. True story. And when I looked back on the previous ten years, all the specks of stardust leading me there became visible in ways I hadn't seen before. That was 15 years ago. And now I'm seeing another trail of stardust gathering with these blogs and other work I'm doing. It hasn't quite formed into anything tangible yet. I'm not sure what I'm doing or why. But I'm following my instinct. I think we all have times in our lives that we wonder what the heck we're doing it all for. Our path may seem fruitless, thankless or unforgiving. But we're throwing out specks of stardust and, somewhere out of our view, something is, nonetheless, in the process of forming. We may have no idea what we're doing, but we can still maintain control over the energy those specks are wrapped up in. Are they wrapped in bitterness? Exhaustion? Hopelessness? Or are they wrapped like the gift they are? This is the second time this week that stardust has been a part of this reading. I have no idea why. But maybe it's a clue that there's magic afoot for us. Even if it's not, we can still proceed like there is, though. I often think back to that day 15 years ago when I made a life-changing decision, seemingly out of the blue. Calling the days and weeks after it blessed or freeing or magic just doesn't seem to do it justice. Everything suddenly made sense and I had complete trust and faith I wasn't being led down this path to fail. Over the past five years I've done a number of things just from my gut without needing to know why. This blog, a series of meditations by the river and all this poking around into tarot teaching and book writing are among them. All specks of stardust gathering into a form I can't quite make out, but sense this year will bring into greater clarity. What might your own stardust be telling you?